The Nebulizer is a small device that atomizes small aqueous volumes in order to effectively distribute particulates and suspensions, for example, for thorough analysis. Throughout work in Electron Microscopy, grids are held vertically in relation to the Nebulizer outlet. 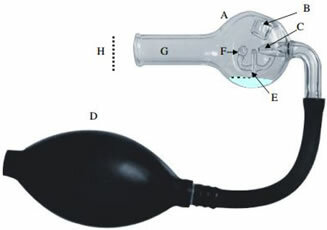 A flexible bulb (D) is squeezed to release a direct spray. The unique all-glass design is perfect for easy, yet thorough cleaning, ready-to-use for all application. Using the Nebulizer enables you to disperse small droplet patterns onto the supporting films. Suspensions that contain particles to be sprayed are inserted from a small Pasteur pipette into the aperture at (B). Enough liquid (approximately 0.1 - 0.2 ml) should be inserted to confirm that the proper level is achieved in chamber (A) (above (E) during spraying)). Air is then passed through the jet tube (C) by pressing the hand bulb (D). Liquid is then drawn through the hollow tube (E) to the diffuser head (F). Small droplets of liquid will begin to pass through the outlet tube (G) and will be dispersed onto the specimen supports (H). Note: The specimen grids must be supported in a vertical position in reference to the Nebulizer (facing the outlet tube). In normal spraying conditions, the aperture (B) is sealed by a rubber stopper. Note: Avoid using solutions with the intention of evaporating dryness within the Nebulizer. After each use, be sure to plug the openings with corks. Pour out any remaining solutions and pump the rubber bulb several times to completely empty the capillary feed tube. Flush with clean water about three to four times to ensure thorough cleanse. The final flushes of the feed tube should be performed using deionized water and then with Alcohol. Once the final aspiration is reached, dry the Nebulizer upside down to prevent the water/alcohol from dripping back into the feed tube. Note: For applications involving infectious samples: Soak the Nebulizer in a strong disinfectant before flushing and rinsing.